Clinton Richard Dawkins FRS FRSL is an English ethologist, evolutionary biologist and author. He is an emeritus fellow of New College, Oxford, and was the University of Oxford's Professor for Public Understanding of Science from 1995 until 2008. Hello Reddit. This is Richard Dawkins, ethologist and evolutionary biologist. Of my thirteen books, 2016 marks the anniversary of four. It's 40 years since The Selfish Gene, 30 since The Blind Watchmaker, 20 since Climbing Mount Improbable, and 10 since The God Delusion. This years also marks the launch of mountimprobable.com/ — an interactive website where you can simulate evolution. The website is a revival of programs I wrote in the 80s and 90s, using an Apple Macintosh Plus and Pascal. You can see a short clip of me from 1991 demoing the original game in this BBC article. I'm here to take your questions, so AMA. Thank you all very much for such loads of interesting questions. Sorry I could only answer a minority of them. Till next time! Are you afraid of eternal non-existence? No matter in what words you describe death, I'm sure that it will always scare me in some way. How do you cope with it? What's the biggest unsolved question in biology/evolution? How long do you think it will take us until we may be able to replicate/imitate the first replicator on earth? What is consciousness and why did it evolve? I recently came across a clip where you and another scientist (don't know her name) dissected the laryngeal nerve of a giraffe to show how evolution cannot have foresight as the nerve that links the brain and the voice box loops all the way down the neck around a main artery and back up the neck again. I thought it was the most magnificent evidence for evolution over intelligent design I had ever seen, and so my question is are there any other examples like this in animals or humans where evolution has "made a mistake" so to speak and created a complicated solution for a simple problem? Thanks for doing this AMA, I'm a big fan of your work in science education. Yes, wasn't that fun? The recurrent laryngeal nerve has long been one of my favourite examples is UNintelligent design in nature. My fullest discussion of it, and other "revealing flaws" is in The Greatest Show on Earth. What is the most misunderstood thing about evolution? I read a few of your books. My favorite has to be The Selfish Gene. The title does not really describe the theory very well, but the book itself was a fantastic bit of insight. My question: What was the funniest bit of hate mail you've received in all of these years? Funniest hate mail, which hasn't so far made it to YouTube: "I hope you lose your watch and are late for an important appointment." Pretty well, thank you. Still can't sing but that's not a great deprivation. I just regard it as an indicator of my recovery. My voice croaks somewhat when talking too, which is more of a nuisance. How sure are you that that photo pairing has not been photoshopped or put throiugh a Morphing program? second question ,Did you ever think that there is 0.0001% that god is exist ? when such thoughts come to your mind how did you deal with it ? Obviously I am delighted that there seem to be so many readers of the illicit Arabic translation. Salaams to all of you. Thank you all very much for such loads of interesting questions. Sorry I could only answer a minority of them. I hope you'll have a look at the Climbing Mount Improbable website (http://mountimprobable.com). I'm spellbound by the fact that the Penguin computer wizards have managed to put a different random biomorph ("Hopeful Monster") on every single jacket of both The Blind Watchmaker and Climbing Mount Improbable. I didn't spot a question on it, but in this anniversary year I'd like to reassert that I stand by every word of The Selfish Gene (and indeed of all my other books). Looking forward to seeing you at the various book signing events that are happening in this anniversary year. 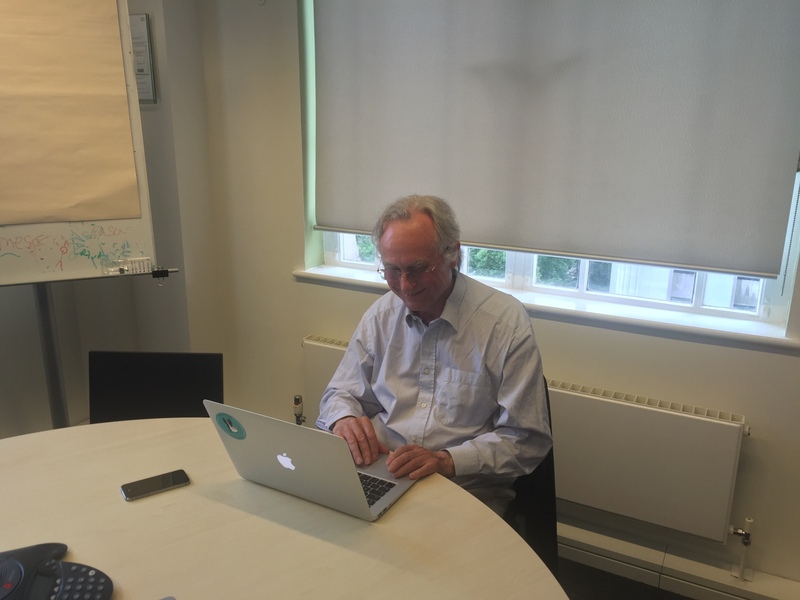 Please keep in touch via http://RichardDawkins.net which has, or will have, all the details, and lots of stuff about my charitable foundation for Reason and Science. See also http://AncestorsTale.net for the astonishing OneZoom fractal tree of life, which forms the backbone of the new edition of The Ancestor's Tale. Is there a question that has given you pause from debaters, referring to god? Assuming you have one, who is your favorite philosopher? What has been the most surprising thing about evolutionary biology that's been turned on it's head, convincingly, in your lifetime? In the last 15 years? Mr. Dawkins, do you think marijuana should be legalized at the Federal level in the United States? Which one of your own books is your favorite and why? Of all my 13 books, hard to say, but I am especially proud of Climbing Mount Improbable, which is, strangely, the book that has sold the least. Richard, since you were programming your own software to model evolution and are probably aware of the process by which programs get written ( hint: they are evolved, with incremental changes from one working version to another)...and since DNA can be thought of as a piece of software, can you comment on what insights writing software has given you on evolution? That's a very interesting question and the answer is too long for this forum. See, however, the 2nd volume of my autobiography, Brief Candle in the Dark. There is an extensive discussion of exactly the question you raise. Mr. Dawkins, what has the recovery process been like for you for the past few months? I was very impressed with the British National Health Service. Physio or other therapists came to my house every day (except weekends) for six weeks after I left hospital. How did you like working with Nightwish? I loved working with Nightwish. They are a wonderful group of people, highly intelligent as well as brilliant musicians. Which one do you think is the most dangerous religion or belief of them all and why? Anyone who believes that what is written in a holy book is true even if the evidence is against it is dangerous. Christianity used to be the most dangerous religion. Now Islam is. Of course that doesn't mean more than a small minority of the world's Muslims. But it only takes a few if their beliefs are sufficiently strong, fanatical and unshakeable. Hello! I am currently reading Frans de Waal's "Primates and Philosphers," in which you are criticized for supporting "Veneer Theory," a theory in which human morality is "a cultural overlay, a thin veneer hiding an otherwise selfish and brutish nature." What type of evidence do you think best supports this theory? What would you say is best course of action for those living in uber religious third world countries who are unable to express themselves without fear of isolation or even violence? It's a terrible situation to be in and I am deeply sympetheti. I think the Internet is a great hope because it penetrates barriers to freedom. My particular hope is that there will be a tipping point when the numbers of people opposed to oppressive religion bursts the dam. I am encouraged to hear that the illicit Arabic translation of The God Delusion has been downloaded 10 million times, 30% of them in Saudi Arabia. What is another physical example similar to the laryngeal nerve that refutes the idea of intelligent design and what does it indicate about our past? Do you think religion is something that humans will ever be able to move on from? Is there a future, given our present path, that you believe sees a majority of the world being agnostic or atheist? What is the most compelling argument for religion you've heard? I have never seen a compelling argument for religion. If I ever saw one I'd convert. How do you respond to the "Embryology in The Quran" argument that Muslim clerics and apologists always put forward as their most important line of defense against anyone criticizing their book's credibility, How can we answer this question once and for all? The embryo is like a blob and then like a leech. Oh my, such stunningly advanced science! Pathetic and ignominious. Nearly as bad as "The sun sets in a marsh". Also, what are your thoughts on the 2016 Presidential Race? Hillary will beat Trump. I'm sorry Bernie Sanders will not have the chance to do so. 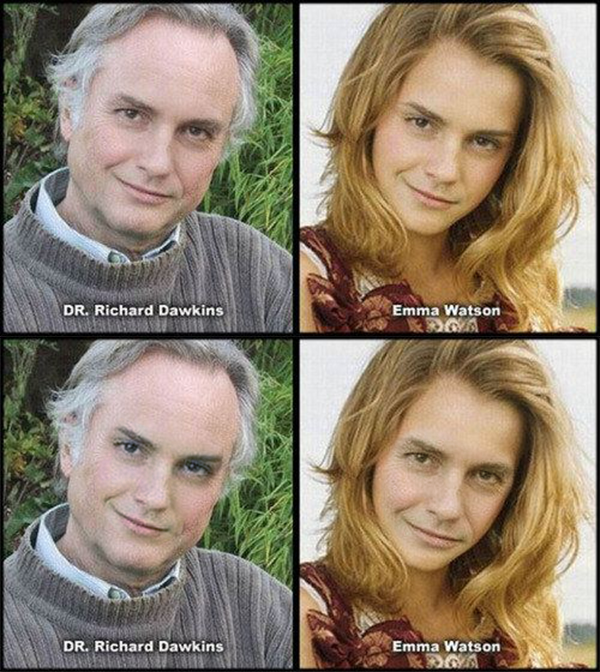 Hi Mr. Dawkins. I first have to say thank you for changing my life with your writing. Not particularly the God stuff but the science stuff. Selfish Gene was a transformative experience for me knowing very little of biology. You really did inspire many years of my life in my 20s. My question is will you ever visit Ontario? Another question is what's your opinion of GMO? I tend to see no difference with it to nature's form of selection. Thank you and please know you are very much admired! Mr.Dawkins, What are your thoughts on Pantheism? What is your favourite sci-fi flick? I haven't seen many. I enjoy Doctor Who in Lalla's era. And Carl Sagan's Cosmos is good, though marred by being soft on religion. 2001 is good too but, surprisingly too optimistic about how far things would get by that date. Jurassic Park has lovely dinosaurs and is marred by the presence of superfluous and irrelevant human drama. Plus the ludicrous nonsense about "chaos theory". Do you have any ideas on what caused the current anti-scientific mindset that is particularly prevalent in the US? I don't know enough about whatever research might have been done. Is it, perhaps, a manifesation of more general anti-intellectualism? What is your favourite type of carnivorous plant? Do you ever still hear from people who don't realize that "gerin oil" was satirical? Many of your articles in Free Inquiry have gone viral or been incorporated into later books, but others have been mostly read in that relatively niche periodical. Are there any you wish had gotten more widespread attention?